I Miss Iraq. I Miss My Gun. I Miss My War. A year after coming home from a tour in Iraq, a soldier returns home to find out he left something behind. If you have yet to claim your retroactive benefits for being stop-lossed between 9/11/01 and 9/30/09 you now have till Oct 21st 2011 to make your claim of $500/month. There are more than 63,000 veterans from the wars in Iraq and Afghanistan in Washington state, and more coming back all the time. And we need to find ways to connect with them. You know when you’re on an airplane, and the flight attendant announces there are American service people onboard, and why don’t we all give them a round of thankful applause? “I just roll my eyes,” said Barrett, 30, a U.S. Army Airborne Ranger who did three tours in Iraq and one in Afghanistan. He finished active duty in May 2009, then served in the National Guard until last February. Barrett doesn’t mean to sound ungrateful. 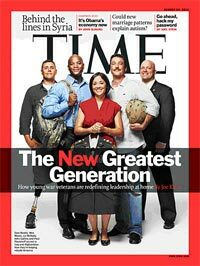 Eight years ago, after the capture of Saddam Hussein in a spider hole,TIME Magazine named The American Soldier its “Person of the Year.” It was an iconic cover story that put a face on these wars and played a decisive role in getting Americans to separate personal politics from their treatment of our troops. Some soldiers have returned from Iraq and Afghanistan with an untreatable lung disease that interferes with their ability to do physical exercise, possibly caused by inhaling toxic material, doctors report.